The first recorded game of Australian rules football in Sydney was between the Waratah rugby club and the Carlton Football Club in 1877, two days after a rugby game between the two clubs and 14 years after rugby was first played in the state. Waratah and some others claimed that the Australian rules resulted in a more exciting game, but the rugby authorities repeatedly rejected suggestions to switch codes or even play intercolonial matches under alternating rules against Victoria. In response, the proponents of the Australian game formed the NSW Football Association in 1880 and in 1881 the first Australian rules game between NSW and Victoria was played in Sydney. The NSWFA was small, with only a few clubs, including Waratah who switched code in 1882, and competition did not begin in earnest until 1889, when clubs competed for the Flanagan Cup. Having trouble gaining access to enclosed grounds, and therefore gate receipts, the association also had trouble with antagonism between its clubs, and it collapsed in 1893. The NSW Football League was born on 12 February 1903 at a meeting held in the YMCA Hall in George St. The NSWFL promoted the game in schools and the Victorian Football League (VFL) held premiership matches in Sydney in an effort to establish the code. In 1908, largely through the switch of codes by the talented Dally Messenger, rugby league established itself into the culture of Sydney, and although Australian football remained popular, the NSWFL was again denied access to enclosed grounds and the new professional code further drew players from the NSWFL. By 1911, Australian rules had achieved more support than rugby union, according to The Referee, but only because the main rival was now rugby league. The Australian National Football carnival of 1933 was held at the Sydney Cricket Ground. Several matches drew large crowds, particularly those involving New South Wales, Victoria, Queensland, South Australia and West Australia. Following the successful interstate football carnival, in 1933 a proposal by the New South Wales Rugby League to amalgamate Australian football and rugby league was investigated and a report, with a set of proposed rules, known as Universal football, was prepared by the secretary of the NSWRL, Harold R. Miller and sent to the Australian National Football Council. A trial game was held in secret, but the plans were never instituted. Three of the original NSWFL clubs are still in existence and currently play in the Sydney AFL — North Shore, East Sydney (now UNSW-ES) and Balmain, but the league never grew to a substantial size or obtained significant support. The first professional VFL/AFL players from Sydney and the Sydney AFL did not begin to emerge until the 1980s. Russell Morris was one of the early players to make the grade, followed by Sanford Wheeler, Greg Stafford, Nick Davis and Lenny Hayes. In recent years, there has been a dramatic increase in AFL players coming from the Sydney region, and in 2007, a total of 11 AFL players identified themselves as coming from this region. Australian Football was introduced to the Riverina region of New South Wales in Wagga Wagga in 1881 with a match between sides from Wagga Wagga and Albury. Subsequently, a local competition formed in 1884 around Wagga Wagga. The league went through many incarnations including the Murrumbidgee District Football Association (1897), Wagga United Football Association (1898–1921), Riverina Mainline Competition (1922–24), Rock and District Association (1925–1926), Wagga and District Association (1926), Wagga Football Association (1928–1957). In these early days, the league produced champion players including Haydn Bunton, Sr.. The South Western District Football League commenced in 1894 and the Farrer Football League commenced in 1957. During the 1970s, the region produced many great footballers including the famous Daniher family, Terry Daniher, Neale Daniher, Anthony Daniher and Chris Daniher. In 1982, at the instigation of the Victorian Country Football League (who had jurisdiction over the area at the time), the South Western District Football League, the Farrer Football League and the Central Riverina Football League were all combined into the Riverina Football League and the Riverina District Football League. The district league reverted to the Farrer Football League in 1985. In 1995, these two leagues came under one umbrella of the Murrumbidgee Valley Australian Football Association. Further south towards the Murray River, the Ovens & Murray Football League including teams from Albury formed as the Ovens & Murray Football Association in the early 1900s. Clubs also formed in the smaller towns around 1900 and played ad hoc fixtures against each other, as well as organising formal competitions during the 1900s and 1910s in southern Riverina such as the Coreen & District Football League (formed as the Coreen Football Association), the Hume Football League and the Albury & District Football League. At the conclusion of the 2007 season the Coreen league was disbanded with most of its clubs joining the Hume league for the 2008 season. In the modern era, the Riverina has produced a wealth of players for the VFL/AFL, including champion players including Wayne Carey, Paul Kelly, Dennis Carroll, John Longmire, Leo Barry, Shane Crawford and Brett Kirk. Some other players from the region to have played AFL level football include Isaac Smith (footballer), Luke Breust, Zac Williams, Dean Terlich and Sam Rowe. Australian football was first played in Broken Hill in 1885 between Day Dream and Silverton. Informal competition began in 1888 between 4 clubs. The Barrier Ranges Football Association formed in 1890, which later became the Broken Hill Football League. In recent years, the area has produced such players as Dean Solomon and Brent Staker. Stephen Hywood played on the Half Back Flank for Richmond in the 1972 Grand Final losing to Carlton. Due to transfer problems he resumed his career at Glenelg in 1973 and played in the 1973 Glenelg Premiership team. Hywood was seen as one of the best Back Flankers ever to play the game. Australian football was introduced to Newcastle, New South Wales in 1883 when the Wallsend Football Club was formed by miners from Ballarat. In 1888, the Black Diamond Cup, Australia's oldest existing and active sporting trophy, was first awarded to the champion team in the region. Five clubs were established in the Newcastle area: Newcastle City, Plattsburg, Northumberland, Lambton, and Singleton. In 1883, a touring South Melbourne Football Club defeated a combined Northern District team by only one goal. In 1888, a touring c defeated Wallsend by 10 goals to 5. The following year, Wallsend defeated Fitzroy. Isaac Heeney was drafted by the Sydney Swans in 2014 making him the first Newcastle-born footballer to play in the AFL. The game was first played at a senior level in 1969. There are eight teams that compete in the AFLSC senior's competition and eleventeams in the reserves. In terms of junior numbers there has been a significant expansion since 1999. AFL players to have come from the South Coast include Arthur Chilcott, Aidan Riley and Ed Barlow. The game was first played in the Coffs Harbour area as late as 1978. The North Coast Australian Football League was formed in 1982 and grew rapidly with up to 8 clubs by 2000. In recent years the number of clubs has declined due to Woolgoolga, Nambucca, Kempsey and Urunga folding. North Coffs and South Coffs were forced to merge before the start of the 2015 season due to lack of player numbers. The area has produced AFL players including Sam Gilbert. The debt ridden South Melbourne Football Club moved to Sydney in 1982 and was renamed the Sydney Swans. It became the first club based outside of Victoria and represented the VFL's first serious attempt to broaden the game's appeal, culminating in its extension into a national competition, the AFL. On 31 July 1985, for what was thought to be $6.3 million, Dr Geoffrey Edelsten "bought" the Swans. In reality it was $2.9 million in cash with funding and other payments spread over five years. Edelsten resigned as chairman within less than twelve months. By 1988 the licence was sold back to the VFL for ten dollars. Losses were in the millions. A group of financial backers including Mike Willessee, Basil Sellers, Peter Weinert and Craig Kimberley purchased the licence and bankrolled the club until 1993, when the AFL stepped in. With substantial monetary and management support from the AFL, the club survived, and with player draft concessions in the early 1990s, has fielded a competitive team throughout the past decade. In 1996 the Swans lost the grand final to North Melbourne, which had been their first appearance in a grand final since 1945. The game was played in front of 93,102 at the MCG. Since 1996, the Swans have made the finals in each season except 2000, 2002 and 2009. The culmination of the recent success is the 2005 premiership against the West Coast Eagles played in front of 91,898 at the MCG, taking the flag to Sydney for the first time and breaking a 72-year drought for the club from when it was based in South Melbourne It also broke the longest premiership drought in the history of the competition. Despite the final success of the Swans, the former Melbourne based club struggled for many years to gain support of the Sydney public. The Australian Football League has expressed intentions to invest in junior development in the growing Sydney market, particularly in Sydney's west and compete head on with the established rugby football codes, particularly under new CEO Andrew Demetriou. A second team in Sydney is a key strategy of the AFL. North Melbourne, who had been suggested as likely candidates for relocation, played several home games in Sydney in 1998. However poor crowds led to the Kangaroos abandoning this practice. The Western Bulldogs have been also suggested as a candidate for relocation. In 2005, the AFL went on a Sydney-centric recruitment drive, offering a NSW scholarships program and young apprentice scheme. By 2007, at least two of the NSW/ACT scholarship recipients had been officially promoted to AFL rookie lists, qualifying them for selection in the senior squad in the event of long term injury to listed players. In 2008 the AFL stated their intention to establish a second team in Sydney, to be based in the western suburbs, as part of the expansion of the competition. This process was completed with the establishment of the Greater Western Sydney Giants who played for a season in the North East Australian Football League prior to commencing competition in the Australian Football League in 2012. The governing body for Aussie Rules in NSW is AFL NSW/ACT. In 2007, there were 7,225 senior players in NSW/ACT and in 2006 a total of around 95,100 participants. Although this makes Aussie Rules Footy one of the fastest growing sports in the state, the overall participation per capita is only about 1%, the lowest in Australia. [permanent dead link]. The Australian Bureau of Statistics "Children's Participation in Cultural and Leisure Activities, Australia, Apr 2009" estimated 18,000 AFL participants in NSW and 1,400 AFL participants in the ACT. (table 22)It should be noted that the ABS utilised a small sample size of 20,126 private dwelling in obtaining their data of participation numbers for 2011/12. The AFL's own Record Season Guide states that for 2011, 131,829 people played the game in the state of NSW/ACT. This figure included 41,626 Auskick registrations. In 2012, the figure was 148,230 people of which 48,965 were Auskick registrations. In 2013, the number of Australian football participants in NSW/ACT had jumped up to 177,949 of which 47,888 were Auskick participants. According to the AFL Football Record this means that the only state that has more Australian football players is Victoria. NSW has now eclipsed Western Australia in participation. 72,393 (2003). AFL Sydney Swans v. Collingwood. (Telstra Stadium, Sydney). 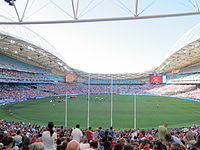 The Sydney Swans averaged 41,205 people through the gate per home match in Sydney during 2006. In 2013, the average has decreased to 29,104. This is partly due to the redevelopment of the Bradman Stand at the SCG. See also: Category:Australian rules footballers from New South Wales. 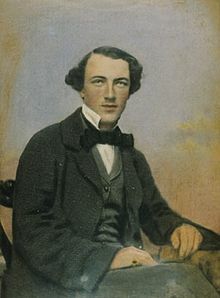 Australian football pioneer Tom Wills was born in New South Wales. A number of notable players have been born in New South Wales or played the majority of their junior careers in New South Wales; many of these players have been from the traditional Australian rules football areas of Broken Hill or the Riverina. Australian football pioneers Tom Wills and H. C. A. Harrison were born in New South Wales in the 1830s. Notable players from the Riverina include: Australian Football Hall of Fame Legend Haydn Bunton, Sr. (Albury), who was the first player born in New South Wales to win the Brownlow Medal and the Sandover Medal, in 1931 and 1938 respectively; Shane Crawford (Finley), became the second player from New South Wales to win the Brownlow in 1999; and Wayne Carey (Wagga Wagga), won the Leigh Matthews Trophy twice in the 1990s. Notable players from Broken Hill include Dave Low, Robert Barnes and Bruce McGregor, who all won Magarey Medals in the 1910s and 1920s, and Jack Owens, a three-time South Australian National Football League (SANFL) leading goalkicker. Many notable players have also been recruited from Sydney, as the game has had a long history, having been played in the city since 1880. This pre-dates many other major sports. Despite the lack of media attention the game has received, Sydney has still generated many players of high quality. Some of the best include Roger Duffy (1954 premiership player who was recruited from Newtown), Michael Byrne (1983 premiership player with Hawthorn who was recruited from the Sydney club of North Shore), Bob Merrick (a leading goal kicker in the 1920s recruited from East Sydney), Greg Stafford (a 200-game player recruited from Western Suburbs in Sydney), Jarrad McVeigh (2012 AFL premiership captain) and Lewis Roberts-Thomson (2005 & 2012 premiership player for the Swans) amongst others. The New South Wales representative team, nicknamed the Blues, played Interstate matches against other Australian states and Territories. The highlight for the Blues came in 1990 when they defeated the traditional powerhouse state of Victoria by 10 points at the Sydney Cricket Ground. The team later merged with the Australian Capital Territory team, to form the NSW/ACT Rams. Notable players to represent NSW/ACT include Brownlow Medalists Shane Crawford and James Hird, as well as Wayne Carey. The team later combined with Northern Territory, Queensland and Tasmania to form Australian Alliance. Interstate football was abolished in 1999 and has not since returned at senior level, apart from a one off Hall of Fame Tribute match in 2008, to celebrate the 150 anniversary of the sport. In modern football, New South Wales/Australian Capital Territory is represented at the under 18 level and in the TAC Cup. ^ M. P. Sharp, Football in Sydney before 1914 Archived 3 July 2008 at the Wayback Machine, Sporting Traditions Vol 4 No 1 November 1987. ^ S. Fagan, 'Rules' Almost Had Sydney's Paddock Archived 17 May 2008 at the Wayback Machine in rl1908.com, 2006. ^ a b "Football gold mined in coal country". Australian Football 150 Years. Australian Football League. Archived from the original on 6 July 2011. Retrieved 18 March 2010. ^ "History of football in this league". Black Diamond AFL. Retrieved 18 March 2010. ^ "Black Diamond Football League Kicking Goals in Grassroots Administration". SportingPulse. 30 September 2002. Retrieved 18 March 2010. "NSW Team of the Century". Full Points Footy. Archived from the original on 9 January 2012.